Many of you that have been to my classes have heard me speak fondly of pasture raised eggs…even seen me pluck off a feather or two (much to the dismay of a few who didn’t realize that feathers might be involved with an egg at some point). This usually leads to a discussion about the difference between eggs and what all the labels mean. Well, there is a vast difference in price and an even more vast difference in quality of the production. Here is some insight and brief description on what it all means. You can also visit the Cornucopia website for the Organic Egg Brand Score Card for the best brand choices. As shoppers we vote every time we buy, the more educated we are the more we can make a diference. 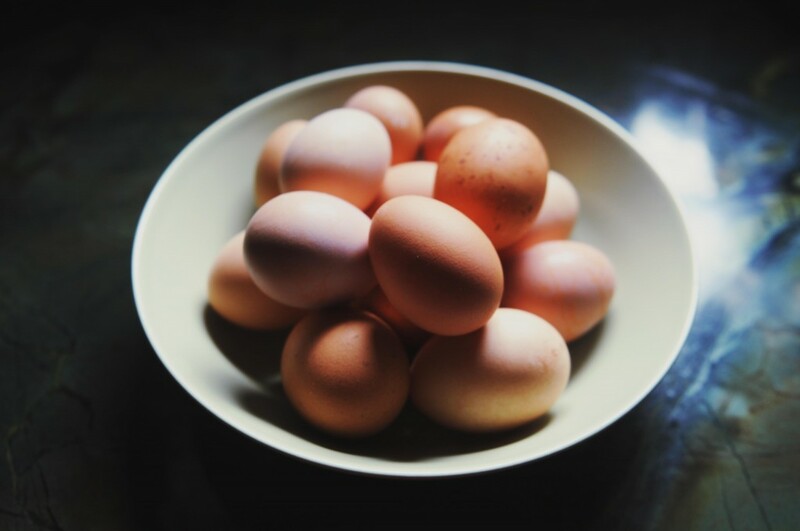 “Farm Fresh” or “Healthy” – The cheapest eggs out there, and there’s a reason for this folks. The chickens eat the cheapest food (including leftover cow and chicken parts) and are raised like an egg-producing factory. They live in cages the size of a piece of copy paper and live in 24 hours of artificial daylight to keep them laying. Their beaks are also burned off so that they do not peck each other from the stress of this lifestyle. “Vegetarian Feed,” “All Natural,” “Omega-3 enhanced” – Still raised in cages but fed grains like GMO soy and corn. A bit pricier but not at all a better life for the hen. 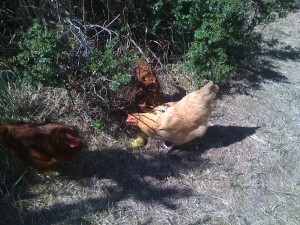 “Free-range” – This means that the ladies have “access” to the outside. This typically means through a small opening at the end of the huge barn that they may never use anyway. It is estimated that only 3% – 5% of tens of thousands of hens even find the opening, chances are they never go outside. “Organic” – They are fed organic feed and have not been given hormones, vaccines or antibiotics. This does not mean however that they have any better quality of life and may still be raised in cages or in large bands on top of each other and their beaks may still be burned off. Better for the human but not necessarily for the bird. “Pasture raised” – The only ones that I will buy these days (unless in an absolute pinch and “organic free range” is all there is). This title means that they have been clucking about in a grassy field eating all sorts of insects, grubs, grasses etc. These eggs will not be labeled “vegetarian fed” however as an insect is not a vegetable…ya dig? They are the most humane option, the best tasting and the most nutrient dense, as they are eating their natural diet and it has far more value than organic soy or corn. They are also the most expensive, but you can save some $$ if you buy them at farmers markets. 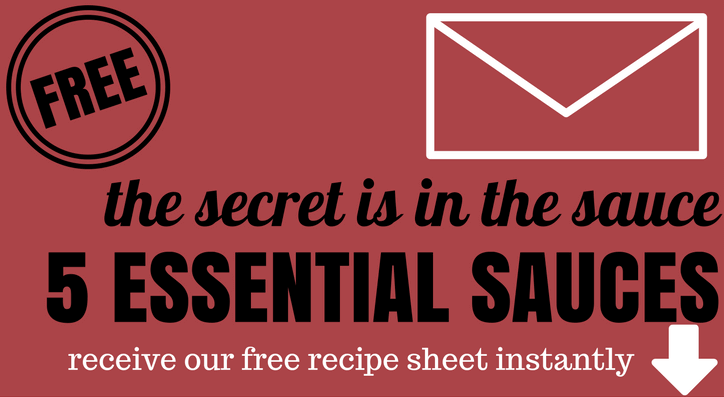 It is worth it for the nutrient value and most importantly, for the chicken. Easiest way to tell that you are getting the real-deal? If your eggs are under $6/dozen don’t buy them. I always say that pasture raised egg will change your life. If you have never eaten a fresh egg with a gooey orange center you are in for a treat! Here is a comprehensive list that will help you make the best choices in the grocery store. Check out this video to drive the point home! Factory farm marketers continue to confuse consumers; to be certified organic you must pasturize your hens, hence the bugs, sunlight, fresh air, etc. and are therefore your best qulity egg. It is best to know your source to differentiate between factory farms and non-factory organic eggs.